It is also known as protocols and informally notes. Minutes can be described as a written record outlining the happenings of a certain meeting, forum or sitting. They may also be taken in a court proceeding. You might have attended a number of meetings. With this, you will definitely get clearly the concept behind having them. In a meeting, they are written by the secretary general of the forum or any member volunteering if the meeting is informal. You can also see Minutes Template. 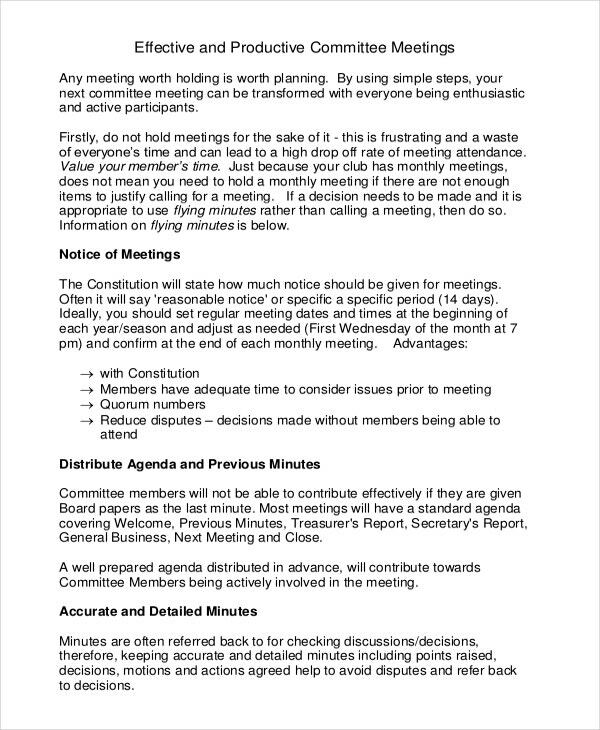 These describe the minutes that are taken at planned or scheduled meetings. 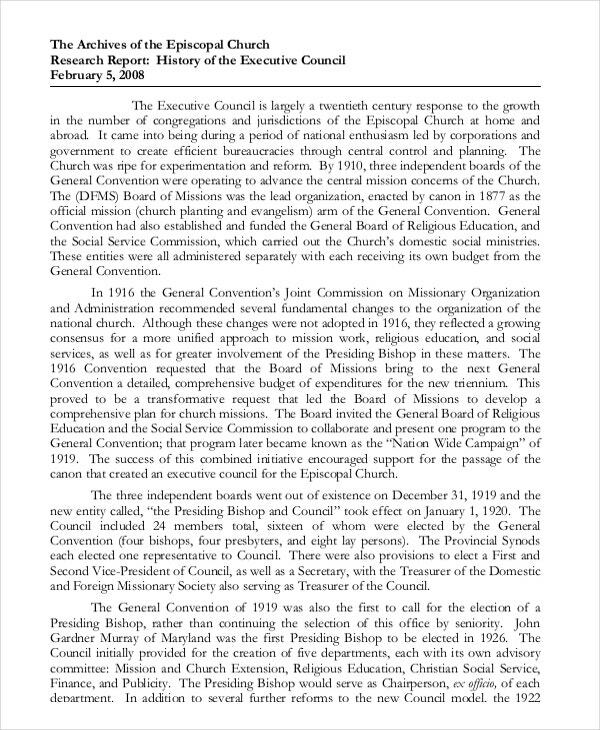 A scheduled meeting is one in which its agenda is known or distributed before the actual date of the forum or the chairperson starts the meeting by announcing the agenda. They have a set of framework in which they should follow. Such minutes are common for internal forums such as in departments or within an organization. These minutes are issue based. 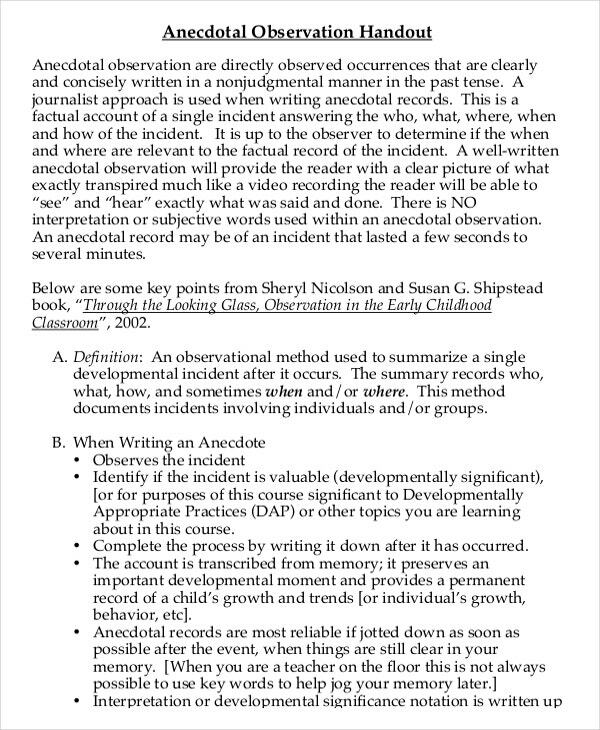 They document the occurrences during a discussion or conversations between officials within and outside the organization. A mission is an event that is carried out for some period. Mission report minutes are therefore a description of the sequence of events that occurred over the given period of time, or while on duty to another foreign land. They contain all the discussions, finding and resolutions arrived at during the mission. They are not majorly focused on agendas but on what was said by a given individual in a discussion. As the keyword describes, they are used to record motions or decisions only. They do not include any discussion. They are majorly applied in formal meetings that require approvals such as budget expenditures, the appointment of a board of directors or a president. 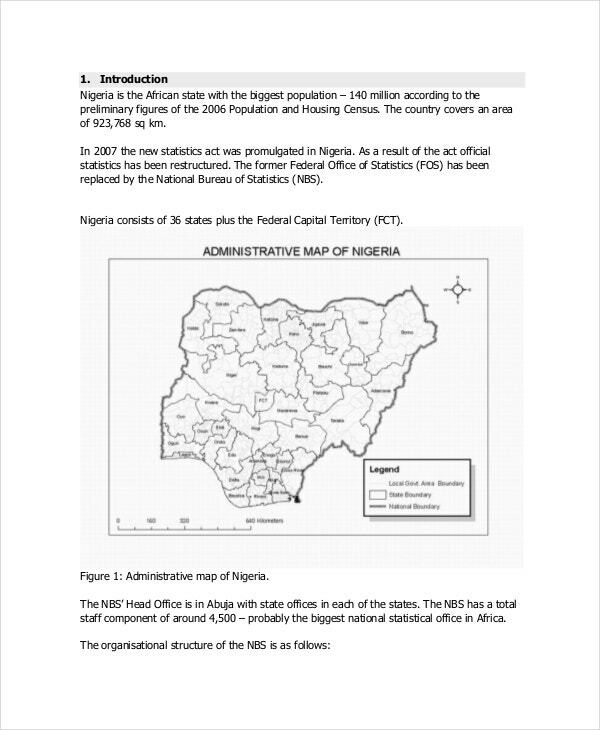 These minutes are inclusive of the discussions and decisions made in summaries. Due to this, they are majorly taken and used in departmental or team meetings in an organization that may require future reference of the debate that went on before reaching a conclusion or decision. They provide a summary of all the discussions that took place, reports received, actions implemented and decisions that were made. They also factor in the names of participating members, proposers and supporters. > What are Minute Templates? They contain all the events of a meeting. Such may include a list of people who were in attendance, the program that was followed, issues and statements raised and discussed by the participants among other many aspects. Before the start of a meeting, it is ideally important to begin the session by reviewing the minutes of the previous session. They are an integral part in contributing to the success of a forum. They should then be dispatched to the attendees of the meeting within 24 hours after the meeting. 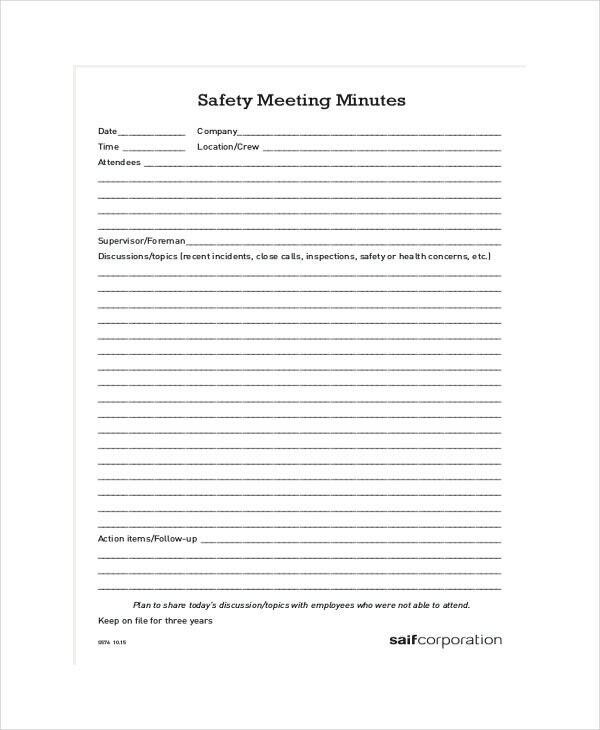 You can also see School Meeting Minutes Templates. They are proof that a legal meeting took place and various decisions were made. They serve as a means of passing information to members who failed to attend the forum. They are essential as legal documents. 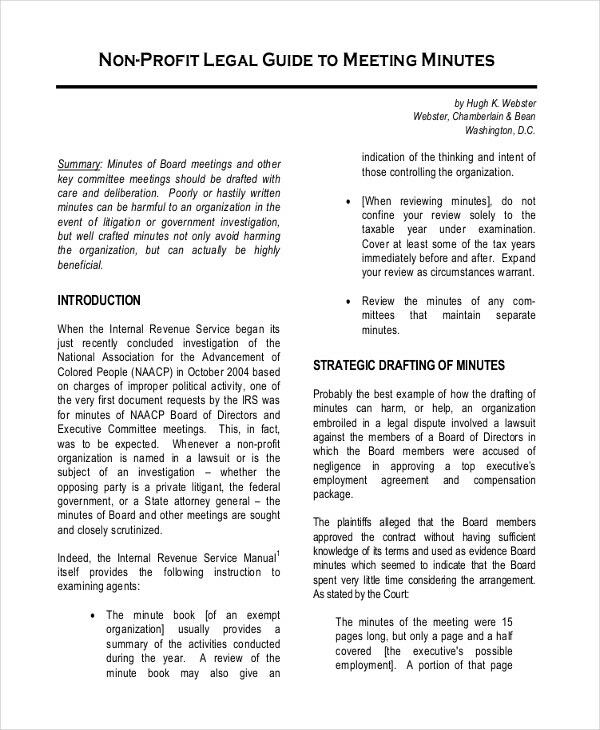 Some cases and legal battles involving many areas may require reference to the minutes of certain meetings as evidence. They provide a source of reference about a certain matter in case clarification needs to be sought. To begin, minutes are written during the procession of the meeting by a secretary, typist or court reporter in case of court proceedings. The individual may use shorthand notations during the actual meeting to cope up with the meeting time. He/she should then prepare another rewrite with detailed information of the meeting based on the notations after the meeting. The concerned person could also record the proceedings as an audio or video before producing them in writing afterward. 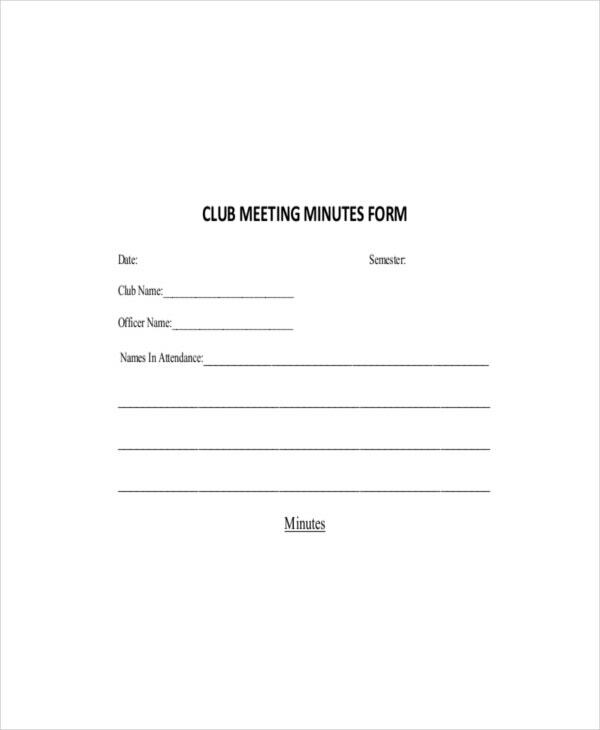 You can also see Club Meeting Minutes Template. 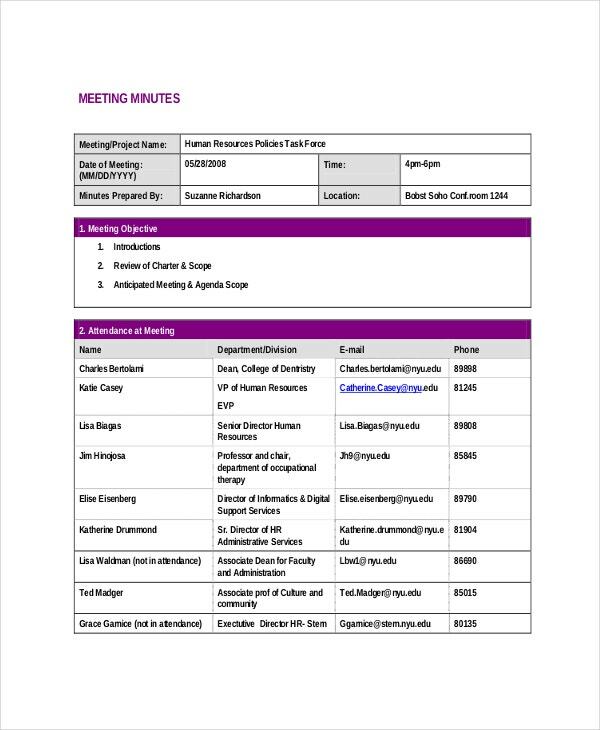 There are also available software packages that facilitate the recording and writing of the minutes.Minutes start with the introduction of the body or organization holding the meeting, the place being held, date and the words the chair called the meeting to order. Other essential topics usually in line then follow sequentially. 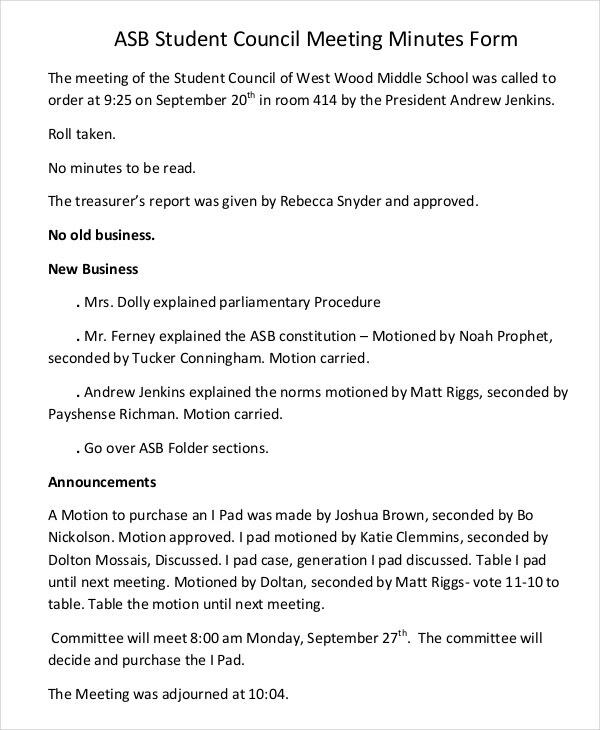 They may then end with a note on what time the meeting adjourned, time, and place set for the next meeting if organized. 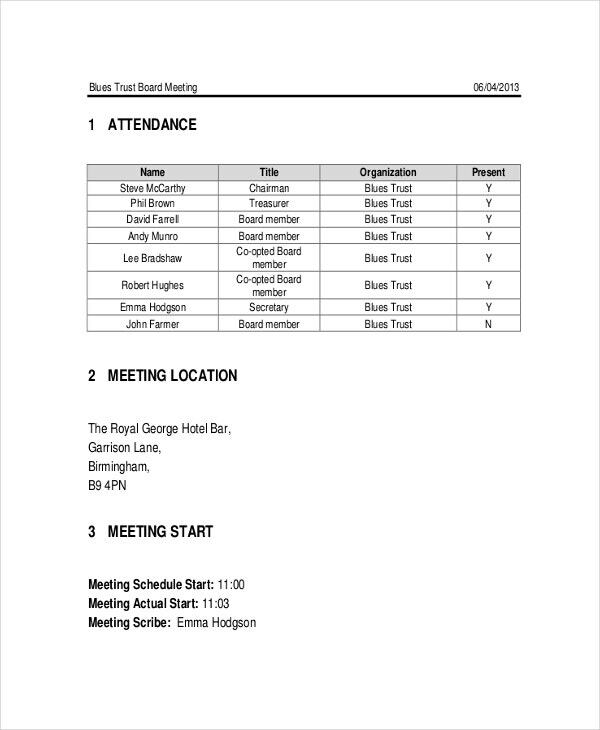 Note every aspect of the meeting including when it happened, those in attendance, those who failed to attend and the topics that were discussed. You should also record the decisions, discussions and commitments made at the meeting accurately. 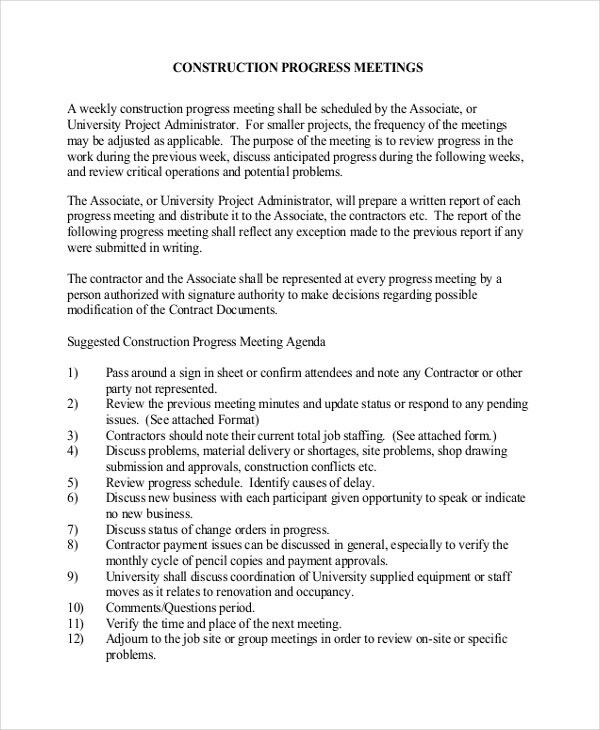 The period of timeline to which the agreed decisions are to be achieved should also feature. 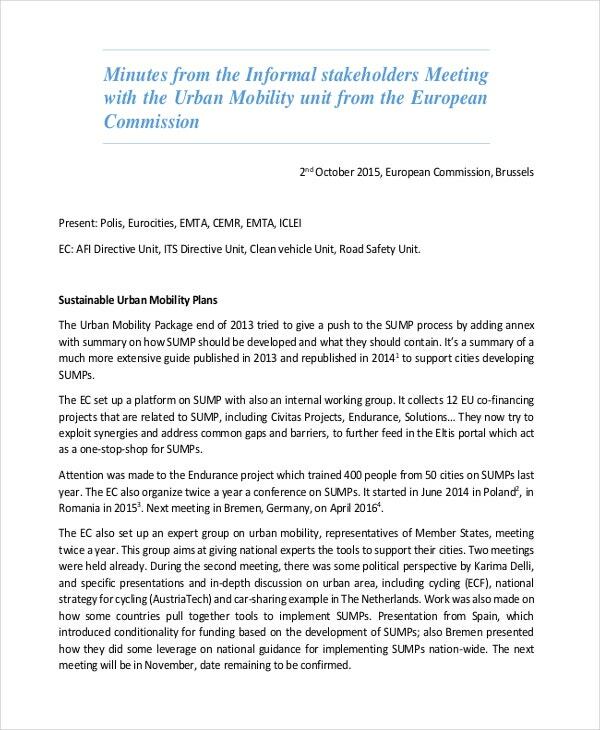 Finally yet importantly, remember to indicate if there is any other follow-up meeting, including where it will be done, time and other essential guides. 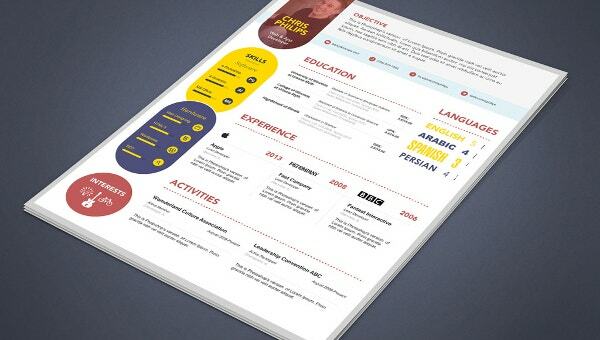 The minutes should also have specific headings to make it easy for future reference. The minutes should have the name of the Secretary, his/her signature, and the date. They should also be placed in chronological order in a book.Be warned to document in a concise. This means bringing up the events in an accurate manner as you avoid including any personal idea or opinion. 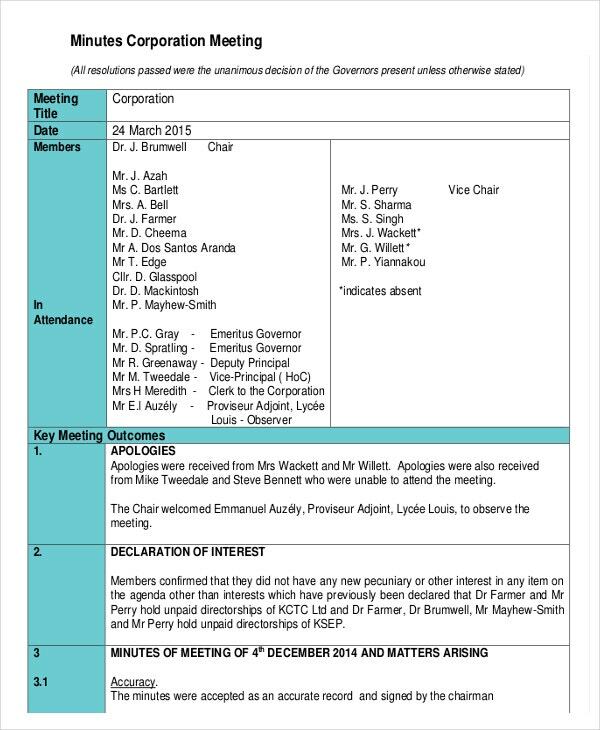 You can also see Club Meeting Template. 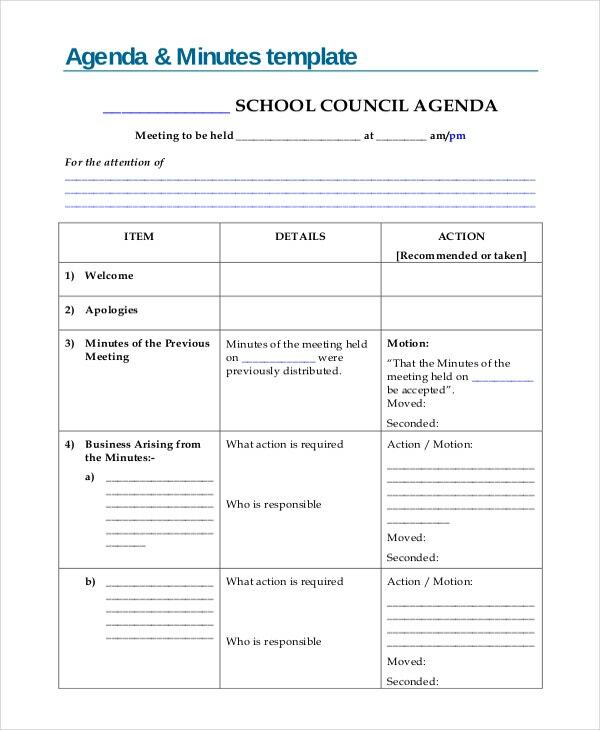 Do write the detailed outline of the minutes the soonest after the forum or meeting. This should be preferably within 48 hours. Do use encouraging or positive language and words to formulate your sentences. For instance, replace the words such as heated or angry in the minutes with positive adjectives such as lively or passionate and energetic. Do not stop or ignore writing the minutes because all the members are in attendance. They are an important source of reference. 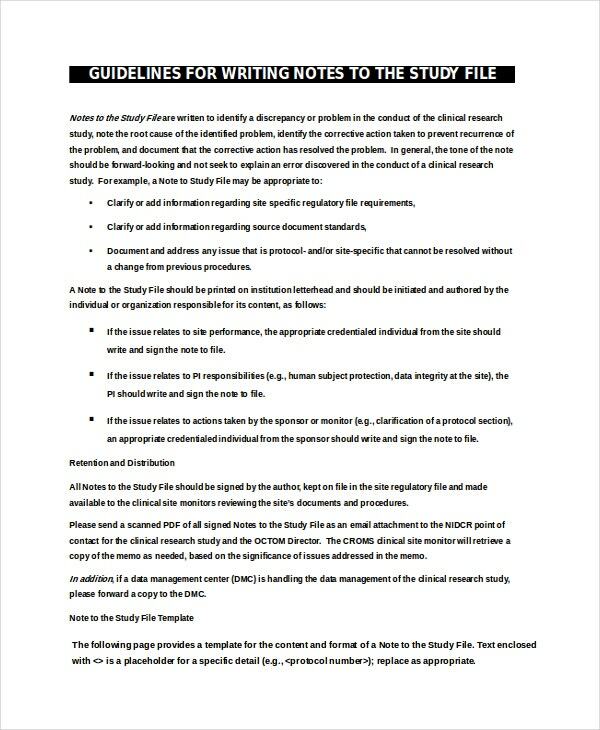 Do not include embarrassing information into the final outline of the minutes. This will demoralize and discourage the attendant affected.